After 2½ months of living the dream, I have to say goodbye to lovely Durham this week. This summer was definitely not enough time to accomplish everything — I would need about a year to finish the multiple dive safety programs and test them out. That being said, I did accomplish quite a bit in this short time, from “saving” the online seminars to starting a module for DAN First-Aid instructors looking at effective teaching practices. It was a hard-working summer that I wouldn’t change for the world. As I am packing, I have been reflecting on this wonderful experience, full of new people and opportunities. From the other interns in Research to the people who make up DAN, everyone has been a pleasure to meet. I am so blessed to have been able to see first-hand how this company functions. I would really love to thank DAN, for sponsoring this internship and allowing me to be in this environment; Patty, for being an amazing mentor and teacher these months; and lastly to the Our World-Underwater Scholarship Society for creating this internship with DAN. This summer was a once-in-a-lifetime opportunity, and I am so happy that I was able to experience it. Now I am on to my next adventure: senior year at Old Dominion University! 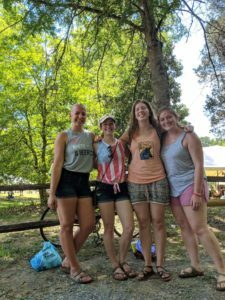 This entry was posted in Internship Journeys on August 23, 2018 by Emily Hellmann. This week we did not go on any field trips, but it was far from boring! 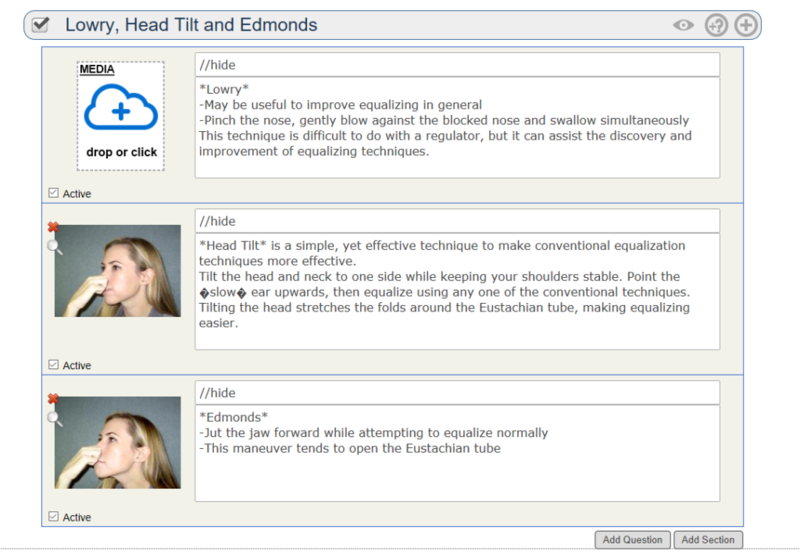 This is what the formatting screen looks like before an image is added. 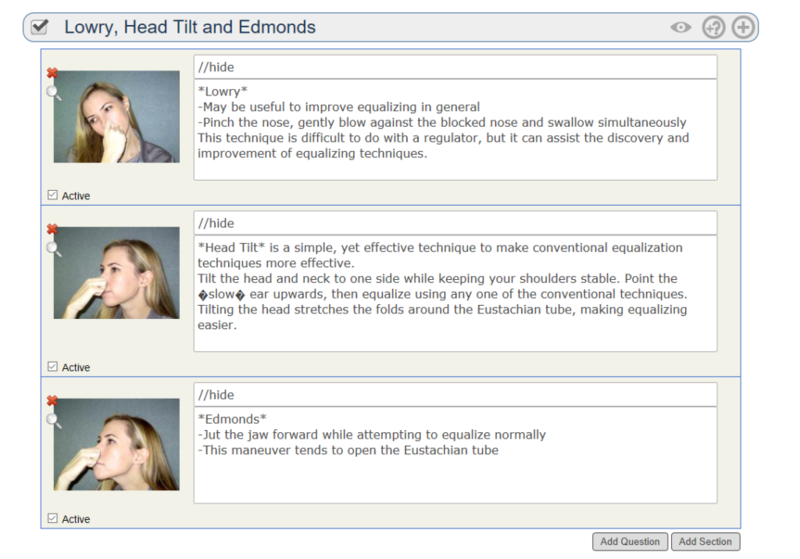 And this is what the formatting screen looks like after an image is added. 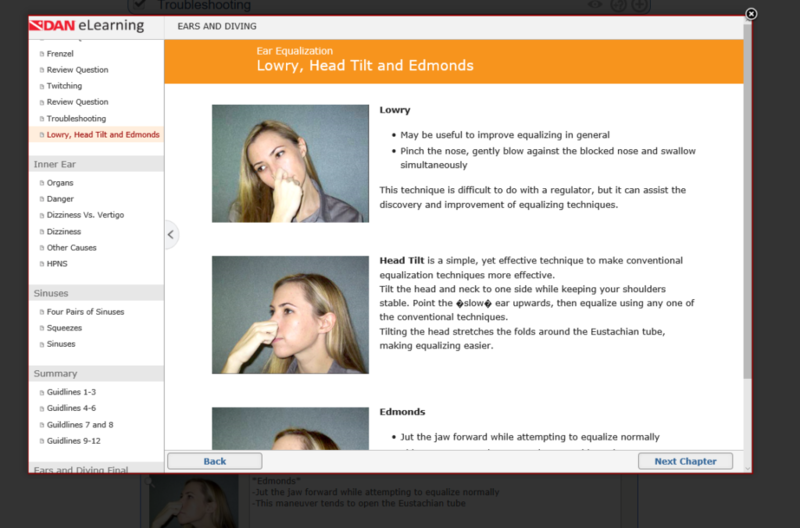 This is what the final product will look like on eLearning. This was a great experience — much different from what I had been doing here with the field trips and the classes. It was so cool to be able to go “behind the scenes” to help build the DAN online education programs. The other project I am working on is creating a program for DAN instructors on education theory and teaching methodologies. I am focusing on “effective teaching practices” for adult learners. This is something I have been looking forward to since Patty brought up the idea. The process and research that needed to be done for this program are so different from what I am used to — teaching practices for children. 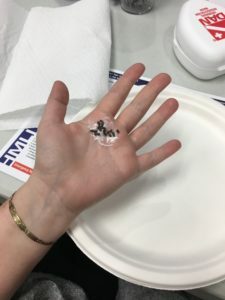 It is interesting to see the other side of teaching practices and compare what I have learned in my university classes with what I am learning here. 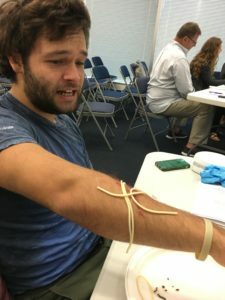 This entry was posted in 2018 DAN, Internship Journeys on July 31, 2018 by Emily Hellmann. Statistics, Cylinders and Chambers, Oh My! Last week was one memorable week here at DAN! I nicknamed it “field-trip” week since most of the week was spent going to different places and experiencing new things. The three places we visited were SAS, Luxfer Gas Cylinders and the Center for Hyperbaric Medicine and Environmental Physiology (also known as the Duke hyperbaric chambers). SAS is a data-analysis company to which customers can submit data for SAS to identify trends they need to monitor. Different types of companies, both local and international, utilize their services, including the city of Durham, Lufthansa Airline and even the transportation departments in North Carolina. The campus where the company is housed is humongous, as big as a college campus! They also have a broad range of services for employees, from gyms to health clinics they can visit. The last field trip we went on was probably my favorite and the most anticipated: the Duke Chambers. I had heard about how massive and impressive the chambers are, and seeing them in person was surreal. There are seven chambers in total, and they are all attached to each other in some way. We were able to go into most of the chambers, but one chamber had patients going through treatment, so we observed from outside. 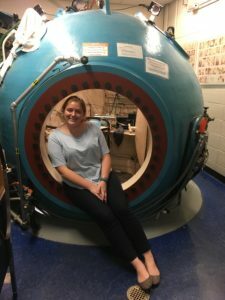 I had always thought chambers were just used for divers, so it was interesting to see non-divers with non-diving-related problems being treated in the chambers. The staff also shared the story about how and why the chamber was built. Its original purpose was for open-heart surgery, but by the time the chamber was finished, the heart-lung machine had been developed, making the chamber’s original purpose obsolete. As of today, there are 14 indications for hyperbaric treatment, so it was not built for nothing after all. This week was full of new experiences, and I cannot wait to see where the rest of my time here takes me! 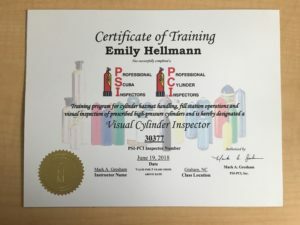 This entry was posted in 2018 DAN on July 2, 2018 by Emily Hellmann. I am 22 years old and from Manassas, Virginia. I have been diving since I was 11, but I’ve been surrounded by the sport since I was little, as my dad is a scuba instructor trainer. Because of my diving experiences, I have always wanted to do something with the ocean in my future career. When I started college, I naturally picked marine biology as my major at Old Dominion University. But after a couple of math classes, I changed to Earth Science Education. It was bittersweet, because it was not what I originally wanted to do, but I would still be involved with the ocean. It was this past semester that I realized I was moving toward what I was meant to do. Watching kids get excited to learn about marine processes really hit it home. If I can get more young people excited about the ocean, then as they grow up, there will be more older people who care about the ocean. Alex, Chloe, Yann, myself, and Burnley after completing our training! My first week lined up with the visit of the Our World Underwater Scholarship Society’s North American Rolex Scholar, Yann Herrera. During this week, the DAN Research interns and myself were able to tag along with him to each department in DAN to hear about what they do. We met with the medics, researchers, the teams from membership, liability insurance, communication and marketing, plus IT, and so many more! It was very interesting to be able to meet all the people who make DAN work and to see just how important they are to the diving community. 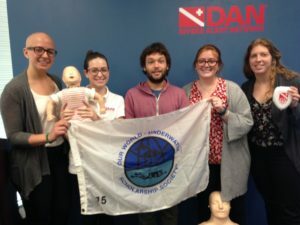 Another great opportunity I had this week was to go through the Diving First Aid for Professional Divers (DFA Pro) course, taught by Patty Seery, DAN’s director of training. It was a very long but rewarding course. 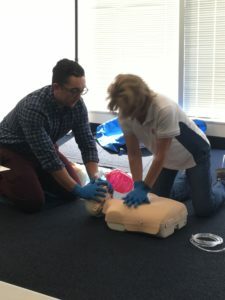 We practiced all skills in the course in a very hands-on manner, from neurological assessments and how to care for hazardous marine life injuries to CPR, first aid and, most importantly, emergency oxygen for scuba diving injuries. It was a lot of fun and I learned a lot. It was a great course!